vietnam at the international baha’i convention, 2013 | doberman pizza. Beginning of the Convention, April 29: After opening prayers, the delegates gathered together to elect the Universal House of Justice. […] It was a great honour for our country, Vietnam, to hear the hall resounding with the cheers and applause of delegates from all five continents, as the name and the map of Vietnam appeared on the hall’s great screen, inviting the Vietnamese delegates [to enter the grand hall]. 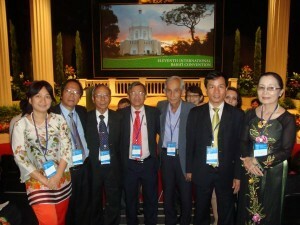 For the first time, Vietnam was fully integrated with the international Bahá’í community. In the afternoon of April 29, about 2,000 people, including delegates, Counsellors, and staff serving at the Bahá’í World Centre converged on the Shrine of Bahá’u’lláh to celebrate the 9th day of the Festival of Ridván. Second day of the Convention, April 30: Discussion of the 2013 Ridván Message. Following the discussion, the results of the election of the members of the Universal House of Justice for the coming five-year period were announced. With over 1,500 votes counted, the names of the 9 members elected were: Paul Lample, Firaydoun Javaheri, Payman Mohajer, Gustavo Correa, Shahriar Razavi, Stephen Birkland, Stephen Hall, Chuungu Malitonga, Ayman Rouhani. In the afternoon was a viewing of a new film, “Frontiers of Learning“, which showed examples of the achievements of Bahá’í communities throughout the world, after which delegates shared experiences of development in various clusters. Third day of the Convention, May 1: Opening the conference on this day was an exciting message from the Universal House of Justice, dated 1 May 2013. In a previous letter [dated 8 February 2013], the House had called for the convocation of 95 youth conferences worldwide from July to October 2013. However, due to the overwhelming response of the youth who wish to be involved in the program to make the world a better place, 95 conferences were not enough to make room for the young participants, so the Universal House of Justice called for the convocation of another 19 youth conferences held in Bertoua, Bidor, Biratnagar, Brisbane, Cagayan de Oro, Georgetown (Guyana), Houston, Kampong Thom, Kigoma, Los Angeles, Mahikeng, Milne Bay, Minneapolis, Montreal, Nuku’alofa, Nundu (Democratic Republic of the Congo), Seattle, Vientiane, and Washington, DC, bringing the total number of youth conferences to be held around the world to 114. Next came discussion on the “three stages of the educational process” [outlined in Insights from the Frontiers of Learning, the companion document to the movie], and the delegates shared their experiences. The afternoon’s discussion focused on “enhancing institutional capacity”. Among the comments shared during this discussion was a comment by a representative of the Vietnamese delegation. Again the hall was full of repeated, prolonged cheering. After the discussion, delegates from around the world shared how impressed they were with the steadfast followers of the Bahá’í Faith in Vietnam and the good relations between the Vietnamese government and the Vietnamese Bahá’í community, and wished the Vietnamese Bahá’ís continued progress. Fourth day of the Convention, May 2: Discussion on “commitment to learning”. Delegates shared and then closed the convention. After a joyful lunch, the representatives once again boarded buses and returned to the Shrine of Bahá’u’lláh at Bahji to commemorate the 12th day of the Ridván Festival. At the end of the prayers, the Universal House of Justice led the delegates in a circumambulation of the Shrine, that they might contemplate and ask [Bahá’u’lláh] for added strength. The 11th Bahá’í International Convention also marks the 50th anniversary of the first election of the Universal House of Justice in 1963. Attending the Convention, delegates got an international perspective. The results show clearly that the Bahá’í world is striving to build a better society, contribute to building an ever-advancing civilization, […] and build up their confidence in the pursuit of their global endeavours, which are carried out in applying the principles that Bahá’u’lláh has brought to humanity in today’s era of maturity. A multi-cultural, multi-ethnic community with so much diversity among nations, but completely united, in harmony and love, working systematically, obedient to their institutions, sacrificing their personal happiness to care for the happiness of all, and working together enthusiastically for the peace and prosperity of mankind. The participants admired the organization of the event, which was thoughtful, perfect and modern. 1: Two members of the National Assembly could not attend due to personal circumstances, but sent their ballots along by mail. 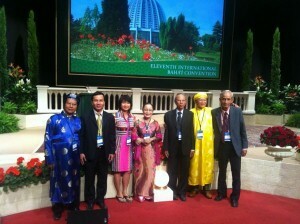 This entry was posted in asia chronicles, baha'i blog, by the way... and tagged convention, vietnam by danger. Bookmark the permalink.